It was an interesting day. I still have non-hiking things to do, and I tried to finish them up today. But it was "one of those days." I can't afford any more of those, and still be ready to leave Tuesday morning. As for the rest of the day... It poured- I mean POURED- all day, so no hiking. I suspect that we are going to get wet on the hike plenty of times, but I don't feel the need to get so soggy when I am home. This morning, I had just finished one thing I needed to do when I got an email from someone who was coming to pick some other things up from me for the trail club. And I didn't have that done, so I had to scramble. Then I got an email that BIL was in the hospital so I tried to track that down because hubby was not home. While the guy was here picking up that stuff the phone rang, and it was the BIL, so I needed to talk to him for a while (he will be fine). I had just started packaging some food when another friend called who needed an ear for awhile. Finally at 5 pm I managed to spend an hour working on hike food. Tomorrow... I have about an hour of work to do for pay. Then, no matter what, I have to switch to full-time hike prep. 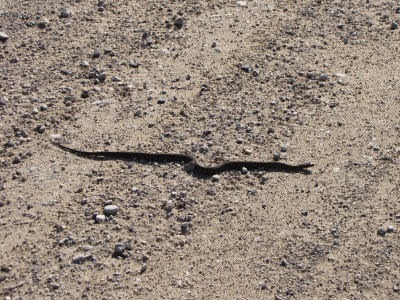 As Maggie and I were walking yesterday, this snake was sunning itself in the dirt road. Now, don't get squeamish and leave... snakes are really fantastic! And this is the first one I've seen this year. So I went closer, and found myself quite mystified. There are only 17 kinds of snakes in Michigan, and I know most of them. Only one is poisonous, is rarely seen on this side of the state, wouldn't go sunning in the middle of a dirt road, and I know what it looks like anyway... this isn't that one (Massasauga). 16 non-venomous choices left. Not a Green Snake (duh!). Not any of the 3 garter snakes, because they have linear stripes. 12 choices left. 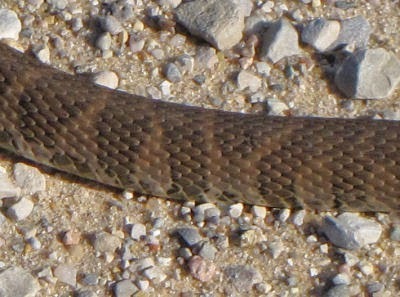 Notice its long slim profile and small head. Very sleek looking! It was about 20 inches long. 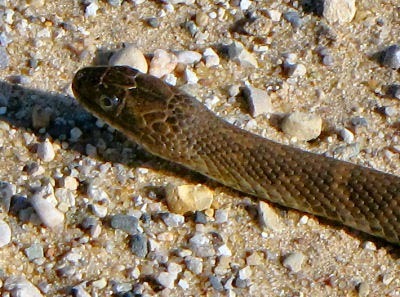 Sleek eliminates the Hog-nosed Snake (or puff adder), a truly ugly snake that looks poisonous, and it hopes really hard that you will think so! Size eliminates the two with red bellies, the Red-bellied Snake and Kirtland's Snake because they are both small, and um... have red bellies. It's not a Northern Water Snake, although the banding is similar. But they have a much more blunt head and tail, are fatter, and are found in the water. They might venture out on a grassy bank, but not to the middle of a bare dry road. Not a Milk Snake, they are really gorgeous with a brown and creamy pattern and a distinctive Y on the back of the neck. Not a ring-neck snake... no ring. I contemplated the possibility of a Rat Snake. They have a faint patterning on their sides, but they are usually closer to black and also are thicker, not as slim. I was running out of options! Actually, those were all the snakes I could think of, standing there in the road, without the snake book, and not remembering that I was counting down from 17. How many have I eliminated now? ... eleven. So, I took these pictures, and told the snake that it was going to move out of the road. 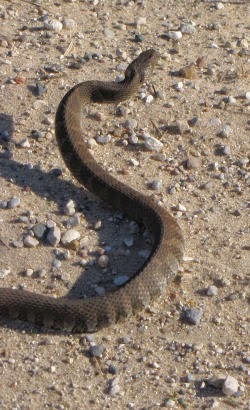 Almost all snakes in Michigan are in trouble... and many, many are killed in the roads. It wasn't happy with my decision. I used my stick to gently move it off to the side, but as you can see, it took umbrage and raised itself up in protest (no attempt to strike... it just wasn't happy). But it did head off to the grass. When I got home and got out the book, boy did I feel stupid! Have you Michiganders figured it out yet? That slim shape is the biggest clue. It's a juvenile blue racer! Now I already knew that they don't turn blue until they are a couple of years old, but I've never seen one this big that still had the juvenile patterns. 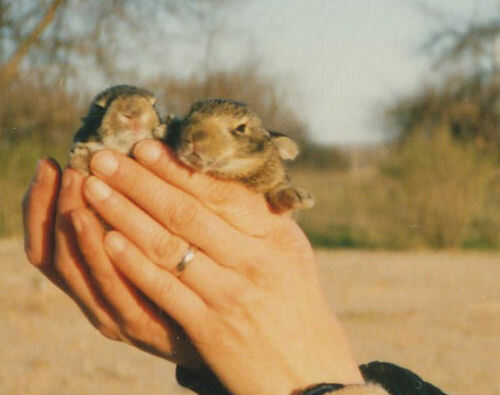 The tiny baby ones are brown and white checkered! And blue racer fits with the jumpy temperament too. 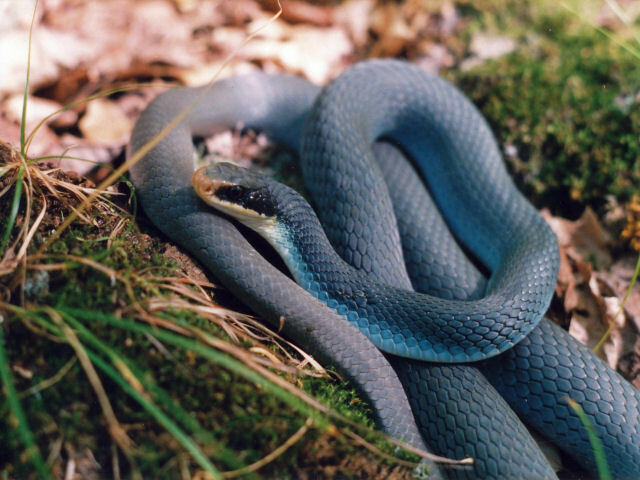 Blue racers can be trained to be calm with careful handling, but they tend to be jumpier than garter snakes. I only feel so stupid because the blue racers are one of my favorite snakes. Here's a picture of a different adult sunning itself one summer day. Note added April 2015: Since making this identification, I have found a young Northern Water Snake sunning itself in the middle of a dirt road. And I've learned how to really tell the difference, but you have to look at the belly, and there are no pictures of this snake's underparts. However, the ID may still be correct. If you look at the third picture, it looks likes the stripes don't continue unbroken around the body, but are breaking up into blotches. That would be consistent with the blue racer. Other than that... it could be the water snake Nerodia sipedon. Packaged some food. I have way too many non-hike responsibilities to finish... it's frustrating. Walked 2 miles with no pack. My knee was a little bit sore, so I walked fast instead of with the weight. I have decided that I will no longer accept paid ads on Entercard. I am unwilling to give Entrecard my Social Security number via a simple form. They insist that they need it to be given the opportunity to cash out what would certainly be less than $100 a year. I earn almost all of my income on line, and no other site has required my tax information until I break the $600/year limit. At that point they properly have asked for an IRS W-9 form. I have no objection to paid ads in theory, but I'm not going to help them earn money that I won't be earning any of. I promised you a gear report for today, but I already have a REALLY COOL item from my afternoon walk for tomorrow, so be sure to come back! With the final demise of the water filter that we have been very happy with for years, the Sweetwater Guardian, Marie and I knew at the end of last summer that we would have to make a change. The Steripen had been recommended to me, and we visited an outfitter and got a lot of good information about the device. We decided this spring to buy one. It arrived this week, and I needed to check it out. Of course the real test will be how it performs over the long haul on the hike, but here's the preliminary report. The first change we were going to need to make was to take a wide-mouth bottle. We've been using empty soda bottles for years (that's another gear story). 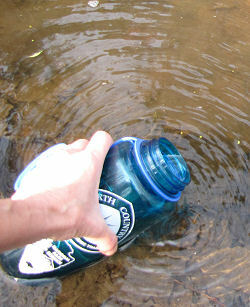 I had one wide-mouth nalgene bottle, so I went to the creek and filled it with water. Of course, you want to be careful not to get sediment in the bottle. To make the test easier, I carried it back to the kitchen. The Steripen works by treating the water with ultraviolet light. This is actually a very good way to kill germs, and more metropolitan water treatment plants would use it except it's difficult to treat those quantities of water in a reasonable amount of time. However, for camper quantities, it's great. 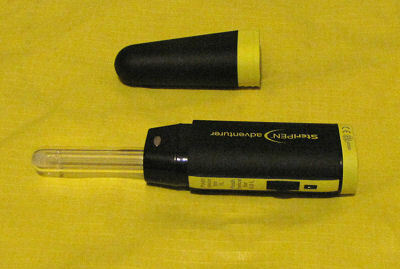 You turn on the pen (it has two batteries in it- an odd size), being sure to choose either the quart or half-quart setting. This bottle is a quart. Then you insert the pen in the water. The contact with the water will complete a circuit and you will see the wand light up. You need to agitate the water to be sure it all gets treated. When the water is all treated a small light turns green. If the wand light goes out but the small light is red, you need to treat it again. I think that the small light is going to be difficult to see outdoors, and it's also in a somewhat awkward location. I was surprised that it took over 2 minutes to treat this quart. I think it took about that long to filter a quart so this won't necessarily be slower, but I don't think it's going to be a lot faster, either. That said, the creek where I got this water is not very pristine, so I think there were a lot of germs to kill. Then I needed to decide how to pack it up. It has its hard case, and then a padded case too. It needs to be wiped dry after every use, so I decided that it should have a dedicated cloth that travels with it. Then I decided that I did not like the blue water bottle. I preferred to be able to more easily see how much sediment I had picked up, and also the blue bottle is heavy. I settled for a wide-mouth plastic Miracle Whip jar. This will be for water treatment, and then the water will be poured into our other bottles. Also in the water kit is a small pile of coffee filters. 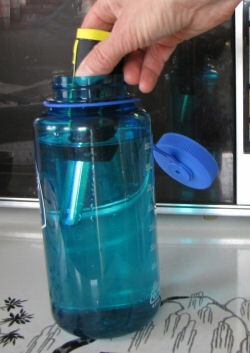 We've found that these are great for those times when you really have to pre-filter water to get a lot of sediment out. 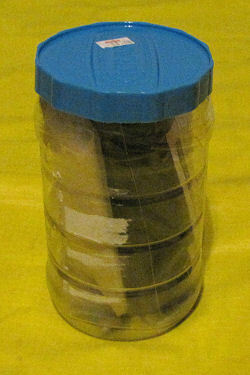 It all packs in the mayo jar, for a nice compact water purification kit. The whole thing weighs 8.6 ounces. 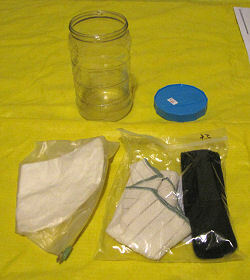 The old filter kit weighed 14.5 ounces. That's a significant savings. Added more details to our custom guide from another source. Did errands all afternoon... getting new first aid stuff, cable and cord fix for the cache rope, a few groceries at a store I don't usually visit, and several other boring things. A few days ago I was really jealous of WiseAcre because he has green things, and even wildflowers already. He told me that at least I was "GREEN with envy!" We seem to be far behind this year. But after all the rain we've had here lately, yesterday things were finally starting to green up. This picture was taken in the drizzle. The shrubbery is just garbage tartarian honeysuckle and autumn olive, but I like how feathery it looked. And I've been watching closely for the few bloodroot that come up in the cemetery. I didn't find them at all yesterday, but look what I found today! There were just two, neither one looking too robust. Seems to me like there used to be a lot more flowers in that spot. But I did find three of these guys! Just green frogs, but it made me feel quite cheerful to find them sunning themselves by the creek. I haven't often seen frogs there for some reason. Checked out our new water purification system. It seems to work fine. I'll probably show you some pix of that tomorrow. Started checking over my gear, made a list of things I need to buy. Worked on updating the spreadsheet with weight of my gear components. Walked 1.5 miles with 45 pounds. 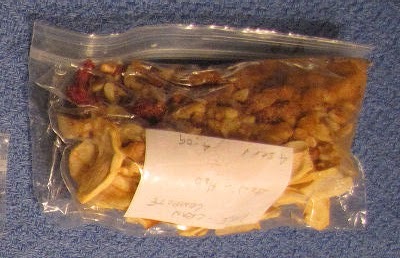 A couple of you have asked for more detail about preparing hiking food. I give seminars on that topic, and am working on a cookbook, but I will share one Hot Meal menu here. It rained almost all day again today, but Maggie and I managed to sneak out between deluges for a walk. We saw cardinals and ducks, and the first kingbird of the year, but I didn't get pictures of any. You can't sneak up on birds when you are intent on walking. 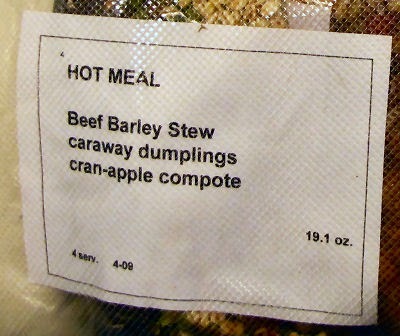 This menu is Beef-Barley Stew with Caraway Dumplings, and Apple-Cranberry Compote for dessert. Every meal is labeled with its type, contents, number of servings, weight, and date of preparation. This makes it really easy to know what you are looking at on the hike, and if packages come home (it happens more often than you might imagine) I don't have to guess about their vital statistics. Two pots are easiest, unless you are willing to spend a long time with the cooking, to wash each pot between courses. We take 2 pots. When the main course is dished up then that pan can be rinsed and used to heat cleanup water, and you still have the other pan for the dessert (if it is one that needs to be cooked). This is one of the more complex menus I do, and one of only two for which I carry liquid oil, but the dumplings aren't right without it. My theory of hiking food is that good food in camp is part of what makes or breaks the whole experience. I'm a reasonably good, but jaded, cook of food at home. However, it all seems different somehow when I'm doing hike food. * To dry sauces: spread any "slurry" not more than 1/4 inch thick on plastic-wrap coated dehydrator trays, dehydrate till at least leathery (for fruit leathers) or dryer for things that will be rehydrated. 1. In your larger pot heat 4 c water, add stew mix, cook gently till rehydrated. 2. Add just enough water to the dumpling bag to make a soft dough. Knead in the bag with fingers till thoroughly mixed. Then add the oil, knead just enough to spread the oil over the surfaces, tear off a corner of the bag and squeeze dumplings onto the hot stew. Cover tightly and simmer 12 minutes without peeking. 3. In your smaller pot, soak the compote mix in enough water to cover. When the stew is off the stove simmer the fruit till soft. If needed add a little more water just to keep everything moist but not runny. Walked 1.5 miles with 43 pounds. Yet another award! This one comes from Joe Todd at My Quality Time. Now with a name like that is was nearly fate that we should like some of the same things, right? Joe also enjoys the outdoors. After linking to the bestower, the award is supposed to be passed to 15 blogs that are new to you. Whew... I don't think I can handle that. I'll look for 10 that I haven't mentioned before, and some are very new to me. Grandmother's Pattern Book, although I should "hate" her because she has made me start another project that I couldn't resist. UpFront News, although I should "hate" it because introduced me to a game that I've become totally addicted to. Montana Moods, one of my first favorites on Entrecard, but I've not given her an award before. Daily Cute, this is a pink and girly blog, but the cute things she picks mostly appeal to me... who knew?! Life with Triplets Who Have SPD, for her honest reporting of the progress of these special and interesting siblings. Tatum Tot Spice, because I'm a sucker for interesting dogs. Nitty Gritty New York City, for amazing pictures of the city where my youngest son lives. I''ll do a regular post in a few minutes. For other awards, click on Awards in the tag cloud. I basically blew off the entire day. It was dark and thunderstormy. I finished a book, played stupid games, and felt sorry for myself for no particular reason. So there. But yesterday a nice little surprise in the rock garden opened. The moles have eaten the tulips and most of the crocuses. But sometimes they just move bulbs or pieces of bulbs around, and then after a few years, a flower will appear somewhere that I never planted it! 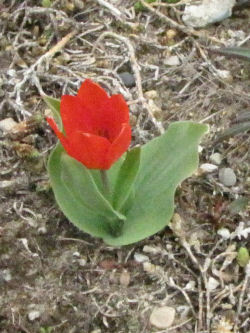 Thus... one red tulip. One of the tasks that must be done in camp every night is to hang the food to keep it safe from the critters. In areas where there are a lot of campers, some animals have gotten smart enough to chew through a cord that you have tied off to an adjacent tree, thus releasing the whole bag to fall to the ground. I've recently learned what is known as the PCT (Pacific Crest Trail) method of hanging the cache which solves this problem. Today I wanted to be sure that it would work with an adaptation that we made a number of years ago after watching a red squirrel climb down the rope to reach our food bag (and he ate all the chocolate! Hey Ratty, maybe it was Mr Nutz's grandad). So we have been using a combination of a cord and a plastic-coated dog cable ever since then. The next day we watched the squirrel try to climb down the cable and learn that he could not hold on to it! We liked that! So, the bottom line is that I made one adaptation today, but I will need to shorten the cable and lengthen the rope to make this really work, because the bag in this picture is only about 7 feet off the ground, which is not high enough. But a shorter cable will fix that, and we need a new cord anyway because this one is getting frayed. I use a bag for the food, a plastic garbage bag liner, an 18 foot dog cable (that I plan to shorten to about 13 feet) [EDIT- I shortened it to 7 feet], a 25 foot 1/8 inch nylon cord (which I plan to replace with 30 feet of cord) [EDIT- I chose 32 feet], a small red bag to store the cord, a keychain carabiner (does not need to bear weight), and a stick that I pick up each night. Of course, you always look for a suitable cache tree near your campsite, but preferably not too near. It needs to have a branch that is at least 15 feet off the ground, strong enough to support the bag weight at a distance of at least 3 feet from the trunk of the tree. It should have no small trees nearby or leaning wood that small animals can run up to get at the food. I went to the cemetery to do this demo because there is a nearly perfect tree there. Perfect trees are found much less often in the woods! Here is the cable and the cord rolled for storage, but not in their small bag. I have tied the cord with a bowline to one end of the cable after sawing off the clip that used to be at that end. Then I taped the cable clamp and cable end so that there are no loose cable ends to catch on anything. At the other end, I've retained the clip that came with the cable (which will clip to the food bag), and added the carabiner. Then I find a length of stick, about 1 inch diameter and 12-15 inches long. Here is another place where I differ from what many people do. Lots of people put a rock in a small nylon bag tied to the cord as a weight to throw over the branch. I'll tell you why I like the stick, and not the rock-in-a-bag in a minute. Then I tie a clove hitch around the stick, and I think it works best if the hitch is not right in the middle of the stick. I do this for two reasons. I think it is easier to throw the stick with the knot farther from your hand. But more importantly, if the stick snags on something it is easier to pull free if the knot is not in the middle. OK, I now have a branch with a cord over it. Then I pull the cord till the cable is over the branch. Then I clip the little red bag on the end, pull it up just off the ground, fasten it loosely and go fix supper! So, you are wondering, "why the intermission?" Well, if we are cooking in the evening, we don't like to wait too late to hang the bag. It can be very difficult at dusk. So I do the cache tree as soon as we pick a campsite. By hanging the little red bag on it I can easily see where it is in the woods. Do you know how hard it is to find a rope hanging on a tree in the near dark? After dinner, all the food goes in the orange bag(s), lined with a plastic bag (scent barrier, water protection). Tie a knot in the cord of the bag. A slip knot will work if you make it the way I am showing here. Basically this just pulls the loop of the knot up from the string between the loop and the bag, rather than from between the loop and the end of the string. 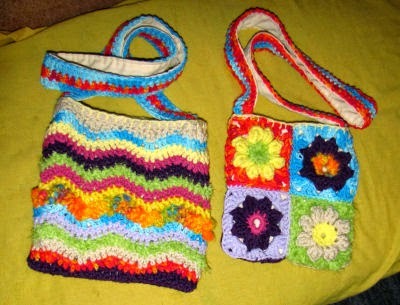 If you do it the ordinary way it will just slip all the way out to the end of the cord, lowering your bag considerably. Then clip the food bag on the cable clip (not the carabiner). Pull the bag up. You want it to end up at least 3 feet from the branch, and 10 feet from the ground, but for now, pull the bag up to the tree branch. Slip the loose end of the cord through the carabiner. Take the stick (if you are doing this alone, you need to already have the stick at hand, in a pocket or something, because you are now holding the food bag in the air!) and tie a clove hitch around it with the loose end of the cord, as high up as you can (knowing the double loop method of tying this knot is very handy here). Slowly let the cord out again until the stick lodges against the carabiner, which will hold the bag up high, and the loose end of the cord will just hang to the ground. Here is the bag close up, with the stick lodged against the carabiner. Here is the bag from a bit farther back. As you can see, there is no cord tied off to the side. In the morning, just pull the cord to bring the stick back down where you can reach it, slip the stick out of the clove hitch, and lower the bag to the ground. Pretty slick, Slick! It was complicated to explain it all, but once you do it a few times, it becomes very routine. One of the first questions we ask when choosing a campsite is, "Is there a cache tree!" Checked out all that I showed above. Filled half the dehydrator, made another shopping list, and went to the store and bought it all. All the hot meals for the hike are completely done, weighed, labeled and packaged. The picture above is 13 hot meals for our hike. We are taking a day off at a commercial lodge and will eat 2 hot meals there, and the last full hiking day we will eat out when we finish for the day. Each packet is about 7"x10". The weights range from just under a pound to 30 ounces. I'm thinking that I've got too much food in that one, and I may change the dessert. These are all for 4 people. 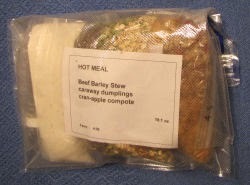 Each pack is labeled with the what kind of meal it is (HOT MEAL for these) contents, weight, date, and number of servings. Sometimes for one reason or another some meals come home uneaten and that way I know just exactly how many they will feed and how old they are. Even dried meals don't last forever. Some things keep better than others. Probably on this trip not much will come home because we are less likely to run into people who want to feed us, since the hike is quite remote. 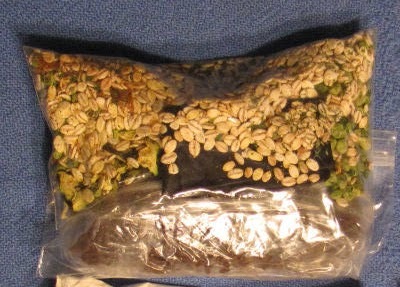 This year I am experimenting with the Ziploc brand vacuum bags. For 2 people the meals often fit nice and tight in a quart zip-closure bag. For 4 people they rattle around too much in a gallon. So I'm trying the vacuum bags to conform the bag to the shape of the package. The results are mixed. Some of them are staying sealed well, others not so much. I haven't tried yet to figure out if I've poked some little hole in the bag, or if the zipper seal isn't quite tight enough. First, just a note about yesterday's post. Maggie and I went out for a short morning walk. Turned out it was still raining harder than I thought, and I had run out without a jacket, so I cut across the field to make it a short walk, and there was that silly ball. It's so odd how little things like that can just blindside a person. Not to mention how it had been there for so long without me ever coming across it before. How about a more cheerful post for today? 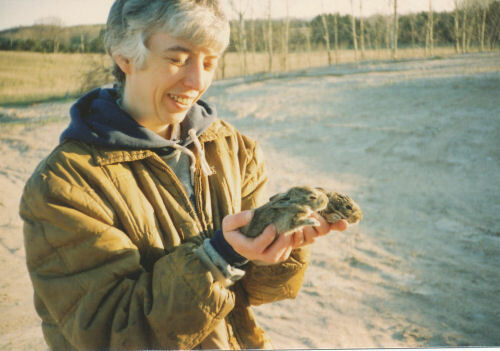 This is Earth Day, and this was the most special Earth Day present I ever had! The year was 1991, and our big, dumb, white dog, Hezekiah, was still alive. He was one of the special ones too, in his own way. He made us laugh so often! That afternoon I saw Heze nosing around in the field like he was playing with something, so I went to check it out. There was Heze trying to get three baby bunnies to play with him. He was such a gentle dog! He hadn't harmed them, but they were soaking wet because he had licked them so much. I wasn't quite sure what to do, but I brought them to the house and dried them off before taking them back to the nest. Worked on food all day. Filled all the trays in the dehydrator: onions, cucumbers, broccoli soup, squash, rice salad, sausage. Packaged a bunch more stuff. It finally stopped raining! Walked 1.5 miles with a 40 pound pack.